I've use this on extention cords for years, and never had a problem. On SKL bridles how is the last knot done to secure the daisy chain from pulling loose? I end up with a twist that forces me to undo one loop at a time. I'm sure it's something simple. If you've tied it for years, you know the basic process. I do it like this. 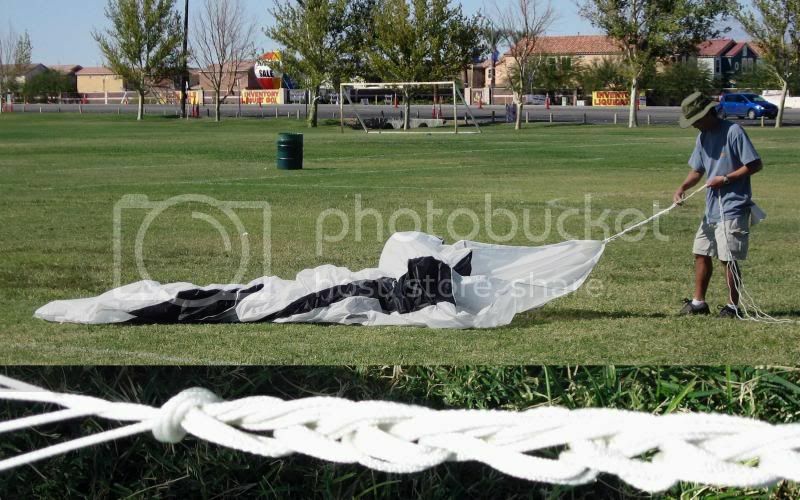 I start the daisy chain as in the vid, near the kite, with a tight loop. That holds that end nicely. My middle loops are really loose to use up line. At the last loop, I don't pull the towpoint through as done in the video. Instead, I pull the last couple of loops tight on themselves and just leave the end free. That holds just fine. Then to undo, I simply pull the towpoint. First thing I learned was to ALWAYS start your daisy chain at the same end of the bridle on every kite. Learned it the hard way and had to undo plenty loop by loop. I always start at the loose end furthest from the kite..(unlike MtFlyer starting at the reverse). It doesn't really matter but doing it the same way EVERY time will insure that you always get it right when you go to fly the kite next time. When I get to the end I just tie the last loop with the remaining bridle using a loose overhand knot. Then when I go to fly I know that I just untie that knot and let it all drop. Practice it a couple times and see what works best for you. Mine don't look as pretty as others because I, like MtnFlyer use pretty loose loops. If your daisy chain gets messed up and instead of pulling out easy you end up with every loop making a knot - it is because the very end of the daisy chain has passed through the loop and you are pulling it out on the wrong side. If this happens, you just have to carefully look at the loop before you pull it tight and pass the end of the line back through the loop so that it pulls the next loop out instead of wrapping around it. Once you pass the end of the line back through the loop so it pulls out on the right side, the rest of the daisy chain will pull out normally. Here's my tip. When you get to around 1 foot of bridle lines left (Starting from the kite end first of course) make the last loop large. Then make a larks head with that, and attach it to the pigtail at the end of the bridle. Then to undo the chain loosen the larks head remove the pigtail and pull. I must have been holding my mouth wrong. lines to the powerkite still attached. I've won many bets to see who can setup and ride away first. Been doing this since I started flying, never had a problem.